A city, predominantly made of red sandstone, Fatehpur Sikri was founded in 16th century by Mughal Emperor Akbar. It is essentially a fortified city built by the king and had been the capital of his Empire for fifteen years. Now a UNESCO world heritage site and a famous tourist attraction, it is a fine example of Mughal architecture. Fatehpur Sikri is home to Jodha Bai's palace, Jama Mosque, Buland Darwaza, and a Tomb of Salim Chisti among many other famous monuments, each of which, is an integral part of the Indian heritage. A unique blend of architectural excellence, as well as religious beliefs - sums up Fatehpur Sikri. This monument was built by Akbar to honour Sheikh Salim Chisti, whose prediction of the birth of a Mughal heir came true while Akbar was visiting the then city of Sikri. In honour of the prophecy, Akbar built this city and Jama Masjid, a stunning mosque which is still in use today. He also undertook the construction of three palaces for each of his favourite wives, one a Hindu, one a Muslim and one a Christian. An Indo-Islamic Masterpiece, Fatehpur Sikri is enclosed by an 11 km long fortification wall which has various gateways. A paradise for History buffs, this place is a must visit! You can go on a one day trip from Agra to Fatehpur Sikri. As the name suggests, Hall of Public Audience, it was meant to hold public meeting and gatherings. The settlement of public grievances at the hands of the Emperor took place over here. It is a multi-bayed rectangular pavilion-like structure which faces an ample open space. Standing on 49 pillars, the Diwan-i-Aam consists of a Jharokha type chamber which is also known as Takht-i-Murassa. This place has beautiful decorations all over its pillars and walls. Made of Marble is the Bethak where the ministers were to sit. Two gateways and three aisles divide the hall. Built in the Persian architectural style, this building was the hall of private audience. Only the royal members assembled here to discuss private affairs. It has a roof with four Chattris. The Central Pillar with a square base and an octagonal shaft has brought fame to the architectural masterpiece. Floral and Geometrical designs increase the beauty of the base and the shaft. Furthermore, it's thirty-six meandering paths act as a support to Akbar's platform. These are connected to every corner of the building on the first floor by four stone walkways. Constructed in 1575 CE, Ibadat Khana or the House of Worship was a meeting house where Akbar had laid the foundations of Din-e-Ilahi. Here spiritual leaders of different religions gathered to conduct the discussions of the teachings of their respective faiths. An extraordinary structure at Fatehpur Sikri, the Panch Mahal has the design elements of a Buddhist Temple. Entirely columnar, it has four storeys in decreasing size built asymmetrically over the ground floor. The structure contains 176 columns with Jaalis or the screens suggesting the presence of the Purdah System which the Queens had to follow. The pavilion gives a splendid view of the fort. Panch Mahal has a pool, the Anoop Talab in front of it which once was a setting for musical concerts. Enshrining the burial place of the Sufi saint, Salim Chisti, the tomb is the most beautiful example of Mughal Architecture. It finds its place in the courtyard of the mosque. Emperor Akbar took on to the building of this tomb as a mark of respect for Salim Chisti who foretold the birth of Jahangir, Akbar's successor. The main building of this tomb is enclosed by the marble screens from all the sides. The door of the main chamber is carved beautifully with the patterns and inscriptions from the Quran. The marble made floor has multicoloured stones laid over it. The inner chamber of the tomb consists of the wooden canopy where inlays the mosaic of the mother of pearl. The Tomb is known for its Child Birth Blessings. Devotees from all over the country visit the tomb with hope of fulfilment of their wishes. People tie threads over the marble screens as a reminder of their aspirations to Salim Chisti. It was a congregational mosque that was one of the first buildings erected in the city. Built in the 17th century, Jami Masjid is a World Heritage Site now. Also known as the Friday Mosque, it is the most visited place in Agra. Devotees consider it as a pilgrimage destination. It contains a single dome with two collonaded halls on either sides. Sculpted Mihrabs adorn the two smaller rooms and the main chamber. The Mosque is a transition in Islamic Architecture mixed up with that of Persian Style. The visitors find golden inscriptions on a royal blue coloured background which is a tribute to this fusion. Following this, the interiors are embellished with watercolour paintings giving a glimpse of stylized floral designs. Corbelled pendentives support the dome in comparison to squinches which support the domes usually. Gate of Magnificence, the Buland Darwaza is a symbol of kbar's victory over Gujarat. It is the grand doorway that leads to the Fatehpur Sikri from Agra. The grand door is the result of 12 years of continuous hard work. Made up of red sandstone and decorated with white and black marbles it is 50 metres from the ground. The archway has two inscriptions, out of which one reads: "Isa, Son of Mariam, said: The world is a bridge, pass over it, but build no houses on it. He who hopes for an hour may hope for eternity. The world endures but an hour. Spend it in prayer, for the rest is unseen". Also known as Harkabai or Jodhabai, Mariam-uz-Zamani was the wife of Emperor Akbar in whose dedication the Palace came into existence. It is an architectural delight for the people visiting the Fatehpur Sikri. The Palace shows a compelling mixture of Rajput and Mughal Architecture. Located on the eastern side of the court, the place was a home to Akbar's Rajput Queens and the other members of Harem. Octagonal at the base, circular in the middle and tapering at the top, the Hiran Minar has a unique build. Initially thought to be a memorial of Akbar's favourite elephant it later served as the purpose of Akash Deep during Akbar's reign. It became a starting point for different mile posts. Akbar's favourite, Birbal was a Hindu minister in his court. The palace finds its place near the northwest corner of Jodhabai's Palace. It contains four rooms interconnected with open doorways. Two oblong porches are also there. These have a pyramidical roof with triangular roof. The interiors are full of single bordered designs, Arabesque geometrical designs, and floral designs. The first floor has beautifully decorated Jharokas and Chajjas. The domes have carvings of inverted lotus and Kalash designs. Tile work can also be seen here. A clone to modern day offices, Daftar Khana was Akbar's record room. It was a place given to the important files and documents associated with his reign. Built on a high platform, the building has facades on all four sides. There is a room inside which has three doorways on its north and beautifully carved tracery work on red sandstones on its south. Known for his bright ideas, Emperor Akbar brought into existence a unique specimen of grandeur and novelty in the form of Pachisi or the Chaupar Court. Built by Kabar in 1572 AD, Pachisi Court served as a place of amusement for the emperors. They played the game of Pachisi, similar to that of modern-day ludo by some and chess by others. The game instead of being played with original tokens or mohras was played with the person in real. The servants were dressed in the form of symbols and on the emperor demands had to make moves. This seemed to be a game, but according to Akbar, this was his way of checking his people's benevolence. 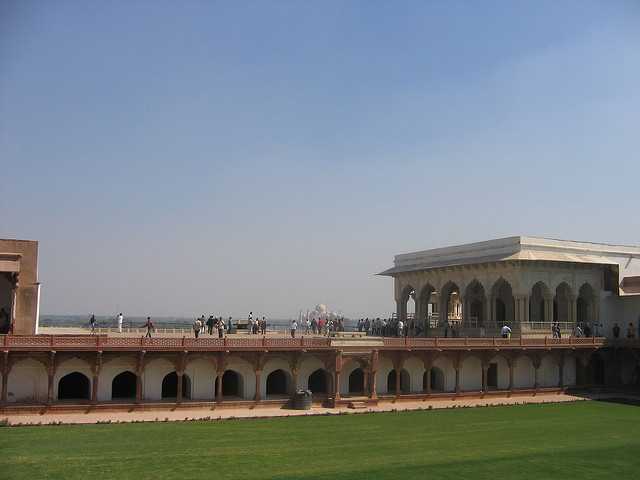 One of the most beautiful complexes in Fatehpur Sikri, it acted as the Emperor's personal place. It has room for the Emperor to hold separate meetings, a Kutub Khana (own library), a small bathroom, and a bed room for the Emperor. The bedroom had covered connections with the Panch Mahal and the Imperial Haram. Where the ground floor is quite simple, the first floor, the king's personal space is pompously decorated with geometrical and floral carvings. The mural paintings on the wall depict the court scenes along with the Persian inscriptions which are now faded. Beside Jodha Bai's palace and opposite to Birbal's Palace lies the Lower Haramsara. The reason behind its construction is ambiguous as for some historians it was a stable and for others was a place of servants. The entire structure consists of floral paintings both inside out. The columns here are a mix of Indian and Islamic designs. Also known as the Naqqar Khana, the musicians over here announced the coming of the Emperor by beating the drums. The vision, planning and finally the outcome of Emperor's imagination is something worthy of a courteous tribute. Rich carvings on the sandstone walls spark the extravagance of the genius work of art. The Akbarnama, written by Abul Fazal, contains a fascinating description of Fatehpur Sikri. The Ain-a-Akbari has properly detailed chapters on the imperial palaces in Sikri and the reason why they were built. The Commentarius by Father Anthony Monserrate is also a brilliant source of information for Fatehpur Sikri. It has details about the minute intrications in the palaces as well. The majestic walls of this small city echoes of the Medieval Mughal Reign. Fatehpur Sikri was the short-lived capital of the Mughal empire between 1571 and 1585 while Akbar was the Emperor. Akbar once visited the village of Sikri to consult the Sufi Saint Shaikh Salim Chisti who predicted about the birth of an heir to the Mughal throne. When the prophecy was proved to be true, Akbar built his new Capital in Sikri. He named it as Fatehabad at first, in which Fateh, a word of Arabic origin in Persian means Victorious. People say that Akbar was so much involved in its construction that he even dictated its architectural style. He planned the complex to be in the Persian Style to revive the Persian courtly ceremony made famous by his ancestor Timur. Moreover, the easy availability of sandstone marked the building of complex with the red stone. The city used to suffer from water shortages and was abandoned shortly after the death of Emperor Akbar. Agra is a place of major historical importance and it is well connected to the other cities in India. There is a domestic airport in Agra from where there are daily flights to many cities in the country. Also, Agra is linked extremely well with all the major cities of India. The main railway station in Agra is the Agra Cantonment. A taxi or a bus can be boarded from outside the station and the airport to reach Fatehpur Sikri. Is it possible to see Agra in one day while staying at Brindaban?